Hardcover, 9 3/4 in. x 8 3/4 in. Gurney's Eagles is the amazing, intimate story of the only modern American racing cars to be victorious both in Grand Prix racing and in the classic Indianapolis 500. When Dan Gurney and Carroll Shelby founded All American Racers (AAR) they wanted to build, in the United States, exceptional racing cars that would gain international recognition. Now, little more than ten years later, AAR stands as one of the world's most respected and successful big-league racing teams. The reasons behind this success are summed up in the AAR cars - the Eagles. The Eagle racing cars have acquired a reputation for speed, precision and elegance, and have competed with a verve and vigor that have captured the hearts of racing fans throughout the world. And their speed records and victories have established Eagles among the top contenders wherever they make an appearance. But their triumphs didn't happen overnight. Anyone who knows anything about auto racing knows that success on the track is usually paid for in advance by failure, frustration and periods of turmoil. To be sure, Eagles have known their times of drought. In racing it is impossible to have every problem licked or to remain permanently supreme. Car designers are constantly experimenting with novel ideas, untried materials; drivers are exploring both human and technical unknowns. In the continual quest for higher speeds, unique problems are encountered which, when conquered, lead to more speed - more new problems. Seldom does one learn what goes on in the minds and shops that produce winners on the track: these gleaming marvels of the sporting world. But Gurney's Eagles provides such an opportunity. It offers a close view of the birth of the AAR team and a detailed account of the development of their handsome Eagles. 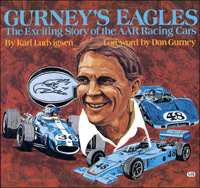 Gurney's Eagles is also the story of dedicated men, such as Dan Gurney, Bobby Unser, John Miller, Harry Weslake and Swede Savage, and of how they molded the AAR machines to be competitive in Grand Prix, Indianapolis, Formula 5000 and Can-Am racing. Few people expected Dan Gurney, AAR and the Eagles to be so successful. It is not surprising, however, that Karl Ludvigsen's telling of their fascinating story makes for such good reading.